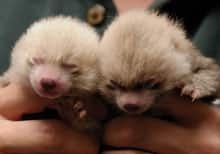 Zookeepers across the continent are celebrating the birth of two extremely rare red pandas at Edmonton's Valley Zoo. The cubs, which were born at 3:26 a.m. Tuesday, are part of a very small population of red pandas in the world. It's estimated that there are fewer than 2,500 red pandas alive in the wild because the animals' natural habitat in China, India and Nepal is being destroyed. Forty red pandas are being raised in zoos. The Valley Zoo has joined an international breeding program in an effort to keep the species alive. Currently, the cubs are being kept away from the parents because the mother, Lala, was over grooming them and causing lacerations. Awasome blog and really beautifull job about painting.